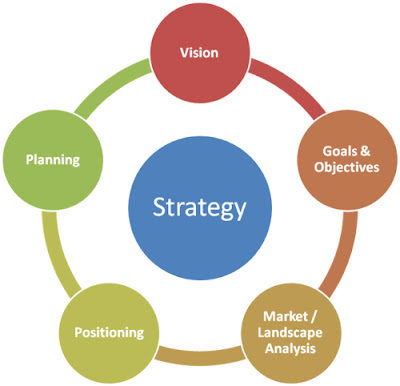 Strategy is simply a plan to achieve a goal. Defined in order of goal, then plan - ideally in an evolving feedback cycle. What I'd add is that both goal and plan must be feasible and flexible. If a goal isn't clearly achievable, break it down into goals that are and plan to achieve those instead. Be aware that starting goals are very likely to change when reality bites - and it does! So make sure your goals can evolve and your plans are flexible enough to adapt to change. Ours for example are already evolving and it's only been a month! How do you know if your goals are achievable? Well, research and analysis is the answer. Has it been done before? Was it successful? Is there really a gap you can fill? Trawl the Internet; get to a library; ask your friends. At startup stage it's about viability and sustainability. You must be able to validate your startup's vision with data - primarily your unique selling points, the size of your target market and the realistic financial opportunity. We've already looked at Vision and Goals. As a project we're now in the Market analysis stage. I use the term 'Landscape' instead because this isn't a commercial exercise and we aren't looking to 'compete' in the traditional sense. Anyway, on Tuesday, I'll be dragging myself down to the British Library for the second time to get on with the exciting business of trawling through data, thankfully with some help - cheers Howard!